I did not learn how to make a coconut cookie recipe until I was an adult. Coconut was just not one of my favorite cookies when I was young; or for that matter anything with coconut in it. Over the years, I have acquired a taste for everything with coconut in it; maybe that was inherited from my dad! 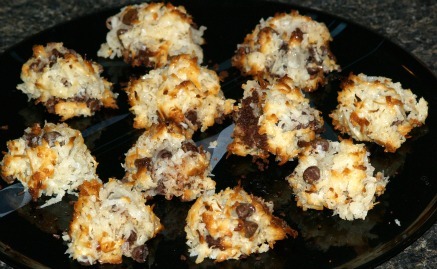 When I learned how to make the coconut cookie recipe below, it quickly became one of my favorite cookie recipes. The word “macaroon” means a very light baked confection and that is exactly what this cookie is. These can be made with ground nuts instead of the coconut which is how the original ones were made. Both are good but I prefer the coconut. They are very light and chewy. This is also a good cookie recipe for those who need to be on a diet free of white flour because it is a flourless cookie recipe. 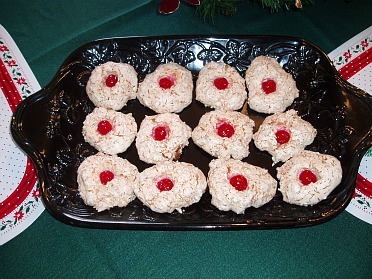 When adding to my Christmas cookie recipes, I give this coconut cookie recipe a bit of Christmas color by toping with a maraschino cherry. When you learn how to make a coconut cookie recipe, you will find it is not always made in the form of typical cookies. Many delicious recipes are made in the shape of bars and squares. These often contain a lot of additional ingredients like chocolate chips, peanut butter chips, butterscotch chips along with a variety of fruits such as dates. If you find a recipe like this that you really like try varying some of the ingredients. You may come up with other recipes with different flavors that you also like very much. This is one of the delicious flourless cookie recipes. Maraschino cherries, rinse, drain and dry on paper towels. Place egg whites in a glass or metal mixing bowl. Beat whites until frothy and begin slowly adding the sugar. Keep beating until very stiff peaks form. Fold in the salt, flavor and coconut or nuts until blended. Drop heaping teaspoonfuls onto ungreased brown baking paper (or I use wax paper) and top each with a cherry. Bake about 20 minutes or until set and light brown. If using paper, remove cookie from pan on the paper, lay a wet towel on the hot pan and place the paper with cookie on the wet towel. The steam will loosen the cookies so you can remove them with a spatula. Sift together flour, salt and baking powder; cream butter, sugar, eggs and vanilla. Combine flour mixture with creamed mixture; mix until well blended. Add coconut and mix until well blended; refrigerate for 1 hour. Shape dough into 1 inch balls and place on cookie sheet; flatten with a glass dipped in sugar. Bake about 12 minutes or until set in center. Line baking tray with brown baking paper; grease paper with solid shortening. Add chocolate chips, vanilla and almond; stir until well blended. Drop by teaspoon onto prepared cookie sheet one inch apart. Bake about 12 minutes or until lightly browned; remove from pan and let set until cold. Combine and mix crust ingredients; pat into buttered 9 inch square pan. Bake crust in preheated oven at 350F degrees until lightly brown about 15 minutes. Combine and mix all the filling ingredients and pour over baked crust. Return pan to oven and bake about 20 to 25 minutes. Cool completely in pan and cut into bars. 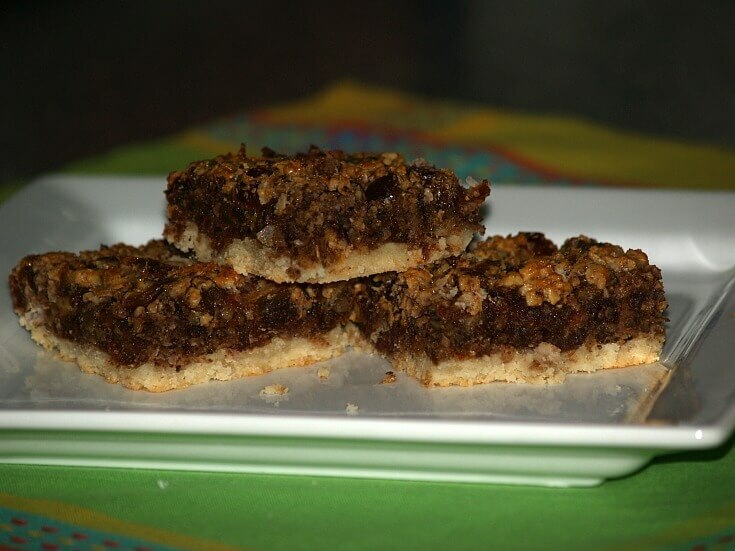 This date squares recipe is a great example of adding other ingredients in a coconut cookie recipe and turning out delicious flavor. Preheat oven to 350F degrees; butter an 8 inch square baking pan. Combine all crust ingredients; blend well. Press crust mixture in the bottom of prepared pan; bake 10 minutes. Combine in a large bowl the eggs, baking powder, vanilla and flour. Beat mixture until well blended; stir in nuts, coconut and dates. Spoon filling mixture evenly over baked crust. NOTE: Using the back of a spoon slightly press down mixture. Bake 30 to 35 minutes until edges start browning. This coconut cookie recipe requires no baking; it can be assembled ahead of time and is very good. Line bottom of 9 X 13 inch pan with whole graham crackers. Combine 1 cup sugar, milk and egg to melted butter in saucepan over medium high heat. Bring mixture to boil for 1 minute and remove from heat. Add nuts, coconut and graham cracker crumbs to hot mixture; blend well. Pour evenly over graham crackers in pan; top with more graham crackers. Combine and blend frosting; spread over top layer. 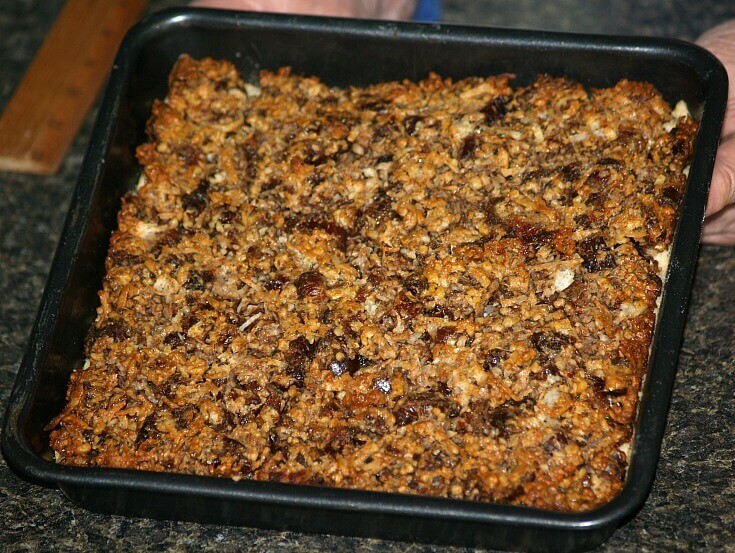 Refrigerate until well chilled or overnight; cut into bars.